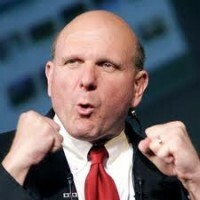 Anybody who has used Windows for more than a few days will bite their tongue when they hear Ballmer state that “you’ll find things on Windows phones that you won’t find on iPhone or Android.” That’s exactly what we are afraid of: patches and updates and blue screens, oh my! Part of the joy with an iPhone is how infrequently you have to reboot it. In a recent interview with The Wall Street Journal, Ballmer explains that the ‘number one way’ to dominate the smartphone market is to have a really great product. He says it with such ease and confidence that you almost forget that to date, Microsoft hasn’t accomplished this task. That isn’t the best part of the interview of course, because Ballmer also lets us know that when it comes to smartphones, “people actually have to be able to see them, touch them and feel them.” Interesting words from the CEO of a company that only formally announced smartphones of their own with an updated Windows 8 operating system on Monday. The rest of the interview is entertaining far more than it is informative. Ballmer happily describes the kind of integration between Windows devices that Apple and Android devices have enjoyed for years and makes it seem like a few well-placed television ads will change everything for Microsoft. With this interview coming not long after Microsoft Development Director Craig Mundie blamed “meddling cyber criminals” for the reason his company has fallen behind, individuals can seemingly be assured that Microsoft is full of excuses instead of innovation. Is there a chance Ballmer is right, or did Microsoft become so large and so arrogant that it moved too slowly to stay relevant in this increasingly-mobile world?